Ginger is commonly used as a beverage can to warm the body. Besides being used as a beverage, ginger can also be one of the herbal remedy is good to keep in shape and help accelerate your healing. The content contained in ginger such as calcium, phosphorus, iron, magnesium, copper and zinc, as reported by Healthmeup. Fresh ginger juice is also believed to be able to treat the symptoms of coughs and colds, runny nose stop and help cure headaches and fevers. To cure the flu, you can take a combination of boiled ginger, tea, basil and honey. Ginger can also be helpful in treating respiratory or digestive problems. When added to food, ginger can increase appetite, due to the heat released by the ginger. Ginger is also able to relieve toxins from the body. 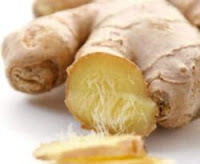 The hidden benefit is another ginger, ginger can regulate enzyme digestion and improve assimilation and transportation of nutrients to tissues. For those of you who often drunk while riding in a vehicle, taking ginger before traveling can help reduce motion sickness.